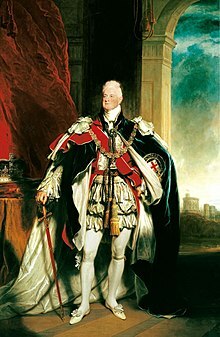 William IV (William Henry; 21 August 1765 – 20 June 1837) was King of the United Kingdom of Great Britain and Ireland and of Hanover from 26 June 1830 until his death. William, the third son of George III of the United Kingdom and younger brother and successor to George IV was the last person to rule both the United Kingdom and Hanover. His niece, Victoria, only ruled the United Kingdom and not Hanover. He lived for 20 years with Sophia Jordan. They had ten children. All William IV's legitimate children (children with his wife) died before he became king, so they were therefore styled as Prince/Princess of Clarence with the style of Royal Highness. This page was last changed on 27 November 2018, at 12:19.